Is Myanmar headed toward a more stable democracy? Years ago, it would have been unbelievable to see Myanmar opposition leader and Nobel Peace Prize winner, Aung San Suu Kyi stepping out of her house in Rangoon again where she has been detained for more than 15 years by the military junta. Suu Kyi has been a democracy icon not just in her home country, Myanmar, but everywhere else in the world where democracy is recognized and practiced. She is the daughter of General Aung San, the leader of the modern Burmese Army, and responsible for the independence of Burma, who is revered as a national hero until today. Unfortunately, Suu Kyi has been banned from participating in the last two national elections in Myanmar for the last three decades. Both of these elections were allegedly rigged by the junta, despite Suu Kyi’s party, the National League for Democracy gaining an upper hand in the first elections in 1990. Even with constant suggestions by the government for her to leave the country to live with her family, Suu Kyi did not even consider leaving her homeland. Her husband Michael Aris died of cancer in 1999 without seeing her (Burma Campaign UK n.d.). In August of 2009, Suu Kyi was found guilty of breaking her house arrest terms, prompting the junta to extend her house arrest to one and a half years, which effectively prohibited her from joining the scheduled election in November 2010 (McCurry 2009). In November 13, 2011, Suu Kyi was released from her house arrest, almost a week after the national elections. This was the first initiative of then the military junta to transition to democracy. The junta-backed Union Solidarity and Development Party won the elections and has since been trying to prove to the world that the wheels are moving toward reforms. For many years, the United States has placed economic sanctions on Myanmar to defy the military dictatorship, but following the “democratic elections,” the US is being asked by sympathizers to the new government and to the junta people to lift the sanctions. The US, however, remains adamant against starting any form of trade with the new government, pending real tangible reforms (Channel News Asia 2011). In August of this year, Myanmar’s newly elected President Thein Sein invited Aung San Suu Kyi to a one to one discussion, but details of the meeting were not disclosed to the public (MOE 2011). But this is not the first time that followers of Myanmar politics are caught by surprise. In April 2011, President Thein Sein appointed, Dr. U Myint, a well-respected scholar, who has served in the UN Economic and Social Commission for Asia and Pacific (UNESCAP) as a senior economist, and who is consequently a close friend of Suu Kyi, to head his economic team (Allchin 2011). The TIME has indicated that all these, including a freer media and the recent granting of a permission to a United Nations human rights envoy to visit Myanmar’s “most notorious” prison, is sending positive signals to the world, that indeed, the government is open to “dialogues” (Marshall 2011). When asked by the BBC News on how substantial she thought the reforms were, Suu Kyi stated that they are beginning to see “changes” and had urged the international community to monitor the situation in their country (Harvey 2011). The question however, is how serious the new government is in pushing for reforms. The Economist stated that no matter how little the movements are, the new government should still be applauded for the movements (“at least there are movements”). Such recent movements also included the instruction of the government to abandon a Chinese funded dam project which invariably raised the eyebrows of the country’s powerful partner in Asia (The Economist 2011). Of course any movement toward any form of reform should prove to be positive. But this will not be a complete transition to democracy anytime sooner. The influence of the military junta lurks behind the government leadership, casting doubt on the sincerity of the new regime. As long as repressive laws are not repealed completely, the political reforms will not be taken seriously and distrust will continue to linger among hardliners. Before any political reform is achieved, a national reconciliation and healing must start. Myanmar cannot afford to earn the ire of the international community. It may have very well been able to resist globalization in the past, through its engagements with China, but with the ever-expanding global interconnectedness, there is no way that Myanmar can stay out of touch with the rest of world. With its poverty rate standing at 26% in 2010, Myanmar truly needs the capital to invest on infrastructure and other social development projects (The News Today 2011). Allchin, Joseph. Democratic Voice of Burma. April 28, 2011. http://www.dvb.no/news/presidential-%E2%80%98advisors%E2%80%99-raise-eyebrows/15438 (accessed October 10, 2011). Burma Campaign UK. Burma Campaign UK. 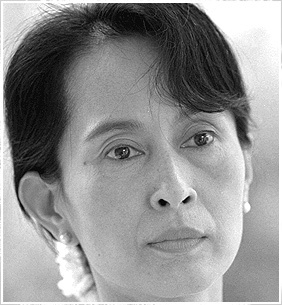 http://www.burmacampaign.org.uk/index.php/burma/about-burma/about-burma/a-biography-of-aung-san-suu-kyi (accessed October 10, 2011). Channel News Asia. US says no to easing pressure on Myanmar. February 03, 2011. http://www.channelnewsasia.com/stories/afp_asiapacific/view/1108591/1/.html (accessed October 10, 2011). Harvey, Rachel. BBC Asia-Pacific. October 03, 2011. http://www.bbc.co.uk/news/world-asia-pacific-15152767 (accessed October 10, 2011). Marshall, Andrew. TIME World . August 31, 2011. http://www.time.com/time/world/article/0,8599,2091229,00.html (accessed October 10, 2011). McCurry, Justin. The Guardian World News. August 11, 2009. http://www.guardian.co.uk/world/2009/aug/11/aung-san-suu-kyi-guilty (accessed October 10, 2011). Moe, Wai. The Irrawaddy/Burma. August 19, 2011. http://www.irrawaddy.org/article.php?art_id=21927 (accessed October 10, 2011). The Economist. The Economist. October 08, 2011. http://www.economist.com/node/21531483 (accessed October 10, 2011). The News Today. The News Today. July 03, 2011. http://www.newstoday.com.bd/index.php?option=details&news_id=32144&date=2011-07-04 (accessed October 10, 2011).